So there’s something undeniably delicious about Samsung’s latest ad campaign – set to debut on American TV on Thanksgiving – which cracks more than a few jokes at the expense of Apple’s most faithful followers. It tracks the queues outside venues that are clearly meant to resemble Apple Stores, formed of people eagerly discussing the product that they’re awaiting. 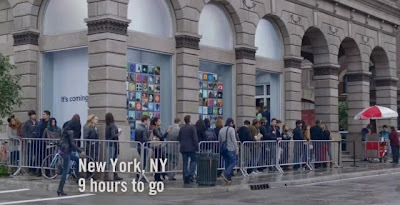 Neither Apple nor the iPhone 4S are mentioned by name, but there are plenty of clues indicating which product the ad is gently teasing; those in the queue make comments such as “If it looks the same, how will people know I upgraded?” while another guy, looking for info on the product online via his current phone, says “Uh-oh… the blogs are saying the battery looks sketchy”. Everyone remains engrossed in their wait for the big product, until they spot other people outside of the queue carrying… you guessed it, Samsung phones – specifically, the Galaxy S II, which is getting a big promotional push in the US this holiday season. “Dude, you’re a barista”, replies his friend.